Last years workshop with Mike & Hanekkah was amazing event! This year, 2016, come to experience the LA Creative String Festival Feb. 13th 10-3p and concert 730p. The first time ever 3 mega string all stars will be teaching and performing together. Mark Summer, Zach Brock & Miguel Atwood-Ferguson. Find out more here. Hailed by Yo-Yo Ma as the “ideal musician of the 21st Century”, Mike Block is a pioneering multi-style cellist, composer, and educator living in Boston, acclaimed by the NY Times for his “vital rich-hued solo playing”. 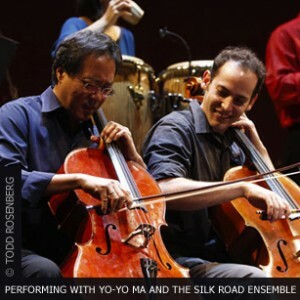 While still studying at the Juilliard School, Mike joined Yo-Yo Ma’s Silk Road Ensemble, and shortly thereafter also joined Mark O’Connor’s Appalachia Waltz Trio, which he played in for over three years. Mike has also toured extensively with Darol Anger’s Republic of Strings and The Knights orchestra. After becoming one of the first wave of cellists to adopt a strap in order to stand while playing, Mike was the first standing cellist to perform at Carnegie Hall, which the NY Times called “Breathless … Half dance, half dare.” In 2012, Mike was appointed Associate Professor at the Berklee College of Music. Parents are welcome to sit in at no charge. What: Please bring your instrument and be ready to play! Admission: $25, please reserve your tickets here.